I'm using Inkscape 0.47, Windows build, Czech locale. I'm trying to set up a rectangular grid. My document is measured in pixels, and the grid should be every 1 pixel both in X and Y dimensions. 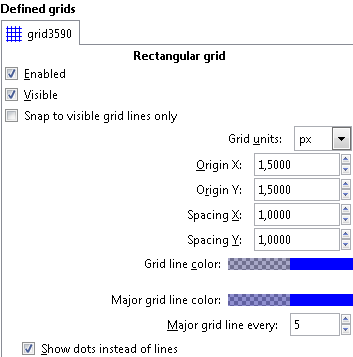 This works, however trying to set the grid origin to be set to (0.5, 0.5) does not, the grid origin remains set to (0,0). Setting the origin to (1.5, 1.5) works correctly, though. This seems to be a bug to me. Maybe locale is the issue as in Czech localization? We use comma (,) instead of dot (.) as the decimal point, ie. Czech "0,5" is the same as English "0.5", see attached grid definition. The bug is not related to the size of the origin offset: only the second time a number is entered into the same origin offset field it is picked up and used in the document i.e. the first offset value entered in a new or previously unedited grid (confirmed with <Enter>, <Return> or <TAB>) it is ignored. This can be verified with the XML Editor - the value for the origin offset is live-updated on change. This error is not noticeable when using the spinbutton arrows or the scroll wheel to adjust the value. AFAICS this bug is not triggered by or limited to certain locale setting. Workaround: if you enter the value with the keyboard, adjust it one step up and back down using the spinbox arrows (or the mouse wheel) or enter a second (different) value. Looks like some sort of event-handling bug to me. It's happening as reported to me too (r9152, Ubuntu 9.10, English). I worked out the workaround too, and also discovered the other spinbox actions work too, using the arrow keys updates it too, so now I just press the Up then the Down arrows and it updates. It's a minor annoyance but I think it's probably just a single line of missing or incorrect code. A method to fix this bug. Thank you very much for your patch! This should affect the vertical spacing of the grids not behaving correctly, however for me it works anyway. The changes from r11133 and r12128 merge cleanly into <lp:inkscape/0.48.x>, and fix the reported problem as expected: the attached patch (include changes from both revisions) was tested successfully with 0.48.x r9963 on OS X 10.7.5. Proposing to include the fix in 0.48.5. Backport patch tested successfully on Windows XP, 0.48.x branch revision 9663. The workaround mentioned above does not work either. To be expected - please check the milestone of the bug report: the fix is in 0.48.5, not in 0.48.4. You can download latest bug-fix release 0.48.5 from inkscape.org. > The workaround mentioned above does not work either. … or possibly your comment is actually a question about usage (beyond the scope of the bug tracker), and not about the issue tracked in this report (the workarounds for the UI bug tracked in this report do work in Inkscape 0.48.4). Note that the grid origin has no effect on the rulers (the origin of the rulers is fixed at the bottom left corner of the page area for now). This bug is also in the GUI for axonometric grids. Tested with current trunk. @houz - would you mind filing a new report for the related issue with the GUI settings of axonometric grids?